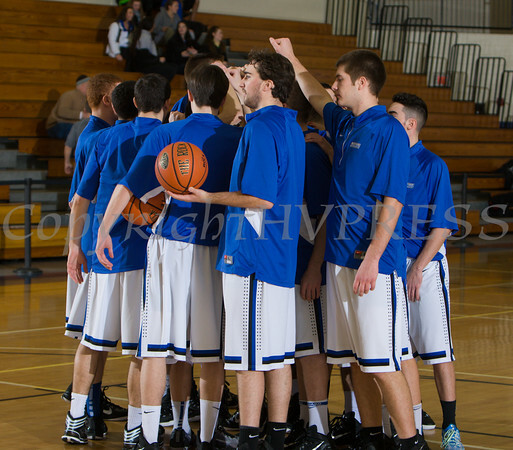 The Mount Saint Mary Knight's huddle up prior to the team falling to the Yeshiva Maccabees 89-79 in their Skyline Conference game on Wednesday, December 10, 2014 in the Kaplan Center in Newburgh, NY. The Mount Saint Mary Knight's huddle up prior to the team falling to the Yeshiva Maccabees 89-79 in their Skyline Conference game on Wednesday, December 10, 2014 in the Kaplan Center in Newburgh, NY. Hudson Valley Press/CHUCK STEWART, JR.